For road drop bars with V brakes. Forged alloy and road racing lever, -compatiable with linear pull brakes, designed for adult bikes with quick release and return spring, - for handlebar diameter of 22.2mm or 23.8mm. ProsPrice, grip and shape, QR mech. Very good levers for V brakes. Better grip and shape than SRAM levers for my hands. ConsFiddly to get on the bars.. Not the most comfortable on the market. Bit fiddly to attach to bars. Needed to detach the Clip from the lever to slide it on before Re attaching the Lever in position.. Plain sailing otherwise,cable feeds though easy enough..Not as comfortable as Cane Creeks but still good value.. easy to tape around the hoods as well.. the Q/R button is excellent . Very handy if using the mini V Brakes.. Does the job well allowing me to use v brakes on drop bars. Hoods could do with being a little wider for more comfort. These are powerful and ergonomically comfy, brake with confidence just using finger tip control and equally good from the hoods. Fitted some quasi drops to a straight bar hybrid & decided to use these with bar end shifters. They work perfectly, enough said really! The choice of drop bar levers to run full size V brakes is very limited, but having fitted these to three different bikes over the years, I wouldn't bother looking elsewhere, as these are so good. For £17 these are terrific value for money and, well they just work and work very well! Fitting is a doddle, the mounting bolt won't strip out at the first sniff of an allen key going near it (unlike the stupid alloy T25 bolt on Campagnolo ergo levers! ), the hoods feel ok, the braking power is as strong from the hoods as it is from the drops and the Campagnolo inspired QR release button is a superb touch. There is of course no barrel adjuster and you'll soon need one as the pads wear, so I would either combine it with a Jagwire adjustable noodle (available from SJS) or better still, pair the levers with the Tektro RL940/941 cross levers that come with barrel adjusters. If you're doing this, bin the whole gunky nightmare that are V brake noodles and use the Origin 8 noodles. Unfortunately there are very few levers for VBrakes on the market. This one is real value for money and defenitely more than you can expect for 20 Euros. They are a little large for smaller hands but do their job quite well. I hope they last for a few years. 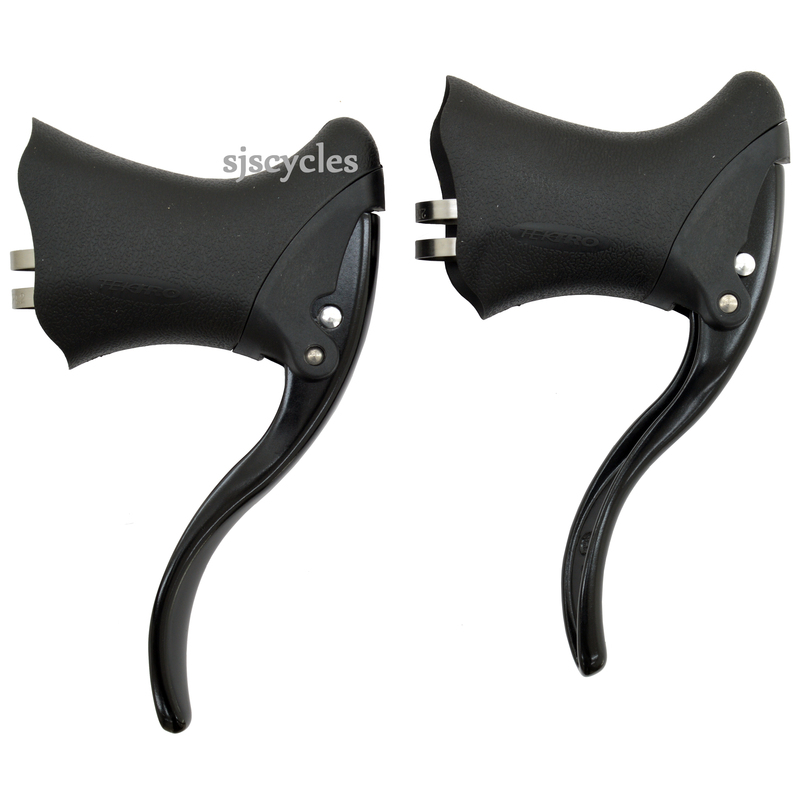 These levers are unbelievable value, build quality is solid , they are very comfortable. They also look very cool. I only ordered these because the Cane Creek equivalents on a different site were out of stock,and blimey was I glad I did.For a start they are a third of the price of the CC items but work perfectly with my hybrid set up of a BB7 disc on the front and V brake at the rear.They don't fade and don't need anymore lever pressure than the Avid speed dials I was using before on a flat bar set up.The hoods are comfortable and they look good,far better than the Dia Compes.Only downside is needing a 5mm hex T bar to tighten the bolt,a multi tool will be too short. I have a Moulton TSR9 which I wanted to convert to drop bars. The bike has Avid Single Digit V brakes, so I needed to pull more cable than normal drop bar levers. I looked at the Travel Agent type adapters but wasn't convinced, so thought I'd try these. I mounted them on Nitto Randonneur bars, and I am pleased to report that they work very well. Please note the body is plastic (which I was initially disappointed with), but my thoughts after a couple of big rides is that this is NOT an issue they appear to be robust and are not squidgy at all. I'm pleased with them. Your service was excellent, I think the levers arrived next day, they are now attatched to my bike, a 2009 Kona Smoke now converted to drop bars from hybrid. I read a number of reviews on possible brake levers to allow drop bar use with V-brakes for good braking power, I can however tell you I have found the performance and finnish excellent, the only viable alternative appeared to be from Dia Compe and the reports on those were very mixed, despite costing considerably more, therefore I am very happy with all aspects of this product, and would recommend it to anybody considering using V brakes with drop bars. Can these be used with side pull brakes? we would need more information than "side pull brakes" - if you are referring to side pull calipers, no these would pull too much cable. These work with direct-pull cantilever brakes such as the v-brakes found on many MTB bikes, as well as MTB cable disc brakes, but not center pull cantilever. Road cable or MTB cable? Do you have replacement hoods for this brake lever? Unfortunately I cannot see that Tektro produce replacement hoods for these levers. Will These Brakes Fit To A 22.2Mm Drop Bar? Thanks. These levers should be fine for use on your drop handlebar. Do You Stock The Bands And Bolts That Hold The Leavers On The 'Bars? We don't have these available as spares form Tektro I'm afraid. or are they extra (you sell for £3 each, not a pair?). If not, how does one adjust vee brakes with these levers? No I'm afraid these are just the levers. We normally recommend using in-line cable adjusters when using this type of levers. Are these levers compatible with your Zoom Anatomic Alloy Drop Handlebars 25.4 mm Clamp Black ? Yes these levers are compatible with those handlebars.